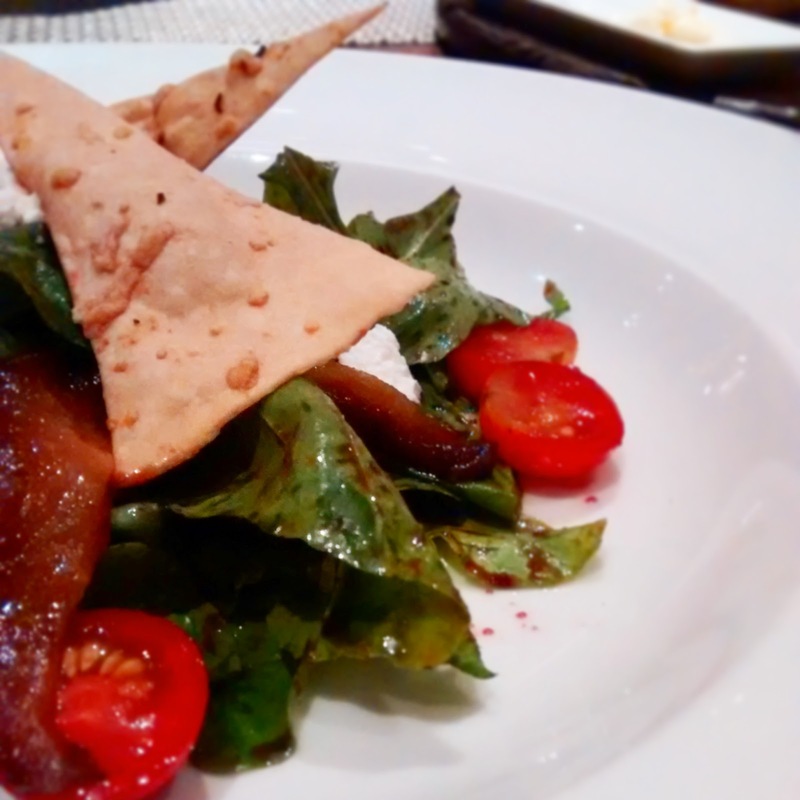 Caramel Wings: Review: Times City Gourmet Week 2014 #GW2014 at Levo, Andheri W, Mumbai. 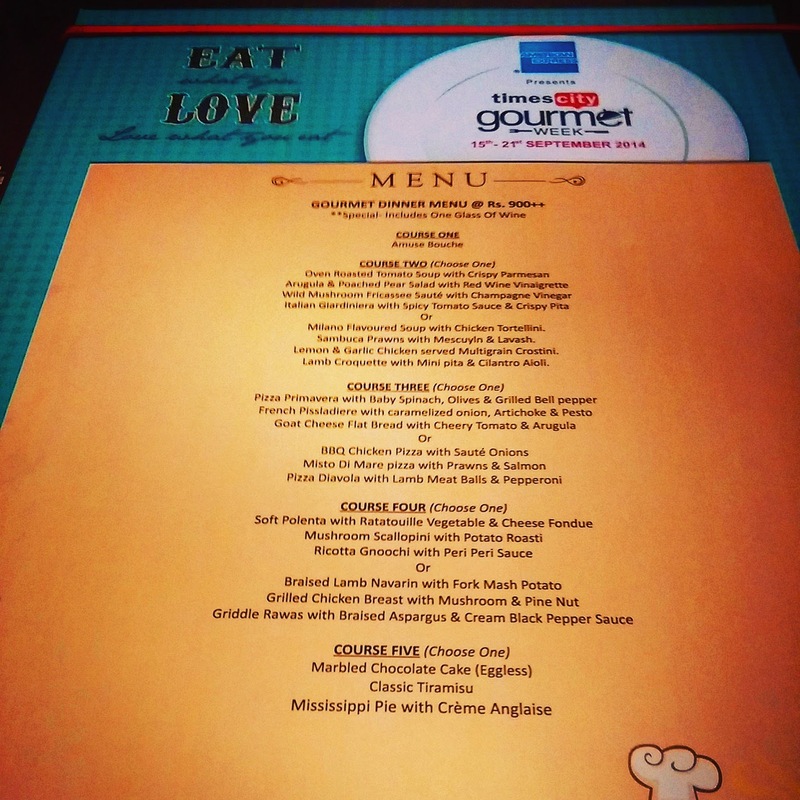 Review: Times City Gourmet Week 2014 #GW2014 at Levo, Andheri W, Mumbai. My life has always been an irony. 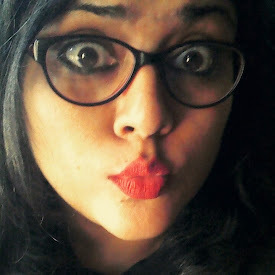 As a kid, I was quite amused at the prospect of wearing spectacles. No matter how much my parents tried to convince me otherwise, and stubborn that I am, I looked into the telly so closely, it would probably put Sherlock Holmes with his magnifying glass to shame. No extra points for guessing that I did end up with a pair of spectacles after years of trying, and hated it almost immediately. I grew up to be a good looking teenaged girl, but chose to call myself fat and lower my self esteem while I spiraled down into an emotional eating phase and actually did end up getting fat. I had Rapunzel- like long tresses which I chose to go chop-chop on, just because I was being rebellious. Hated that too, so decided to bleach my hair... By now I am sure you agree with me. I hated food and cooking before, and here I am, writing a food blog and conducting baking classes, so while I am trying to eat right and shed the excess flab off, it is only fitting for my inbox to be full of invitations to the best restaurants for the best events. I caved in. 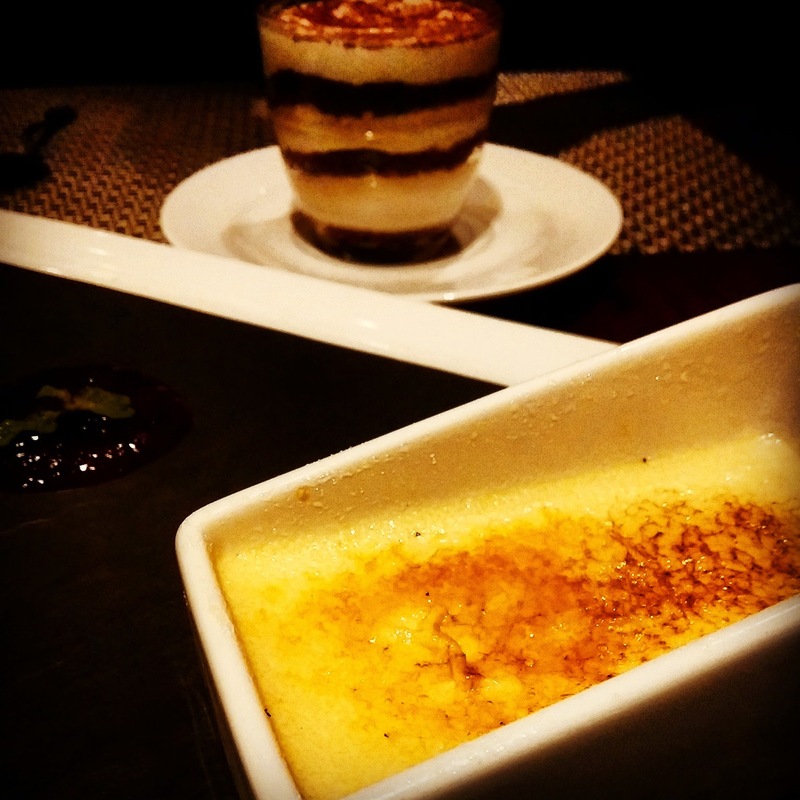 It has been raining Gourmet Weeks in Mumbai off late. Just two weeks ago was the Tastes of Europe restaurant week where top restaurants around the city participated in creating a menu to celebrate the produce of Europe being brought into India, starting with Mumbai. Last year I visited the erstwhile Otto Infinto (now changed to Cafe Infinito) and had a fantastic 5 course dinner. The fond memories made me extra excited about receiving an invitation to attend the Gourmet Week again this year. 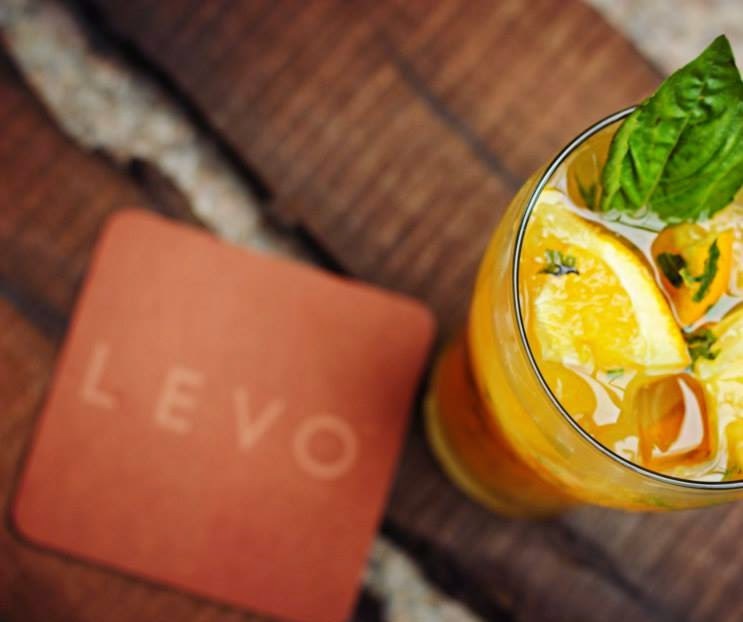 I chose to go to the newly opened Levo in Andheri West, for 2 reasons - First that the menu looked great on paper and seemed affordable, and secondly I really wanted this to be a good experience, for Andheri does not have a good place which serves gourmet cuisine consistently, with that amount of space which can cater to parties and huge crowds. Here is a snapshot of the menu that was created by Levo for the Times City Gourmet Week 2014. 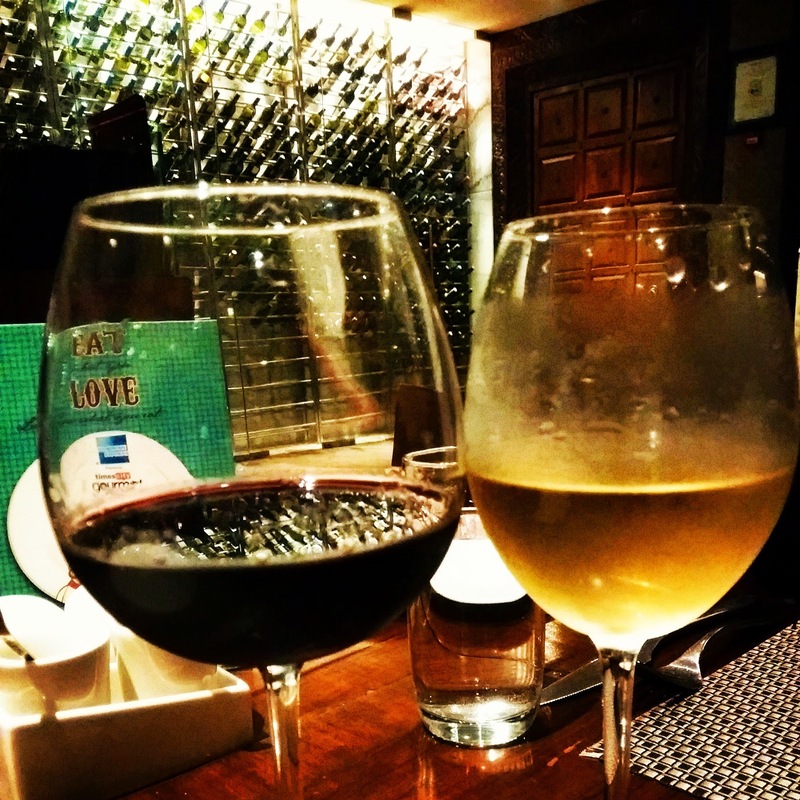 We started off with a glass of wine each, and I went for the usual, Fratelli Chenin Blanc. I can never get enough of this wine. My plus one decided to go for a glass of Shiraz. First Course was the Amuse Bouche, which were Goat Cheese Lollipops, studded with soup sticks and served with a Balsamic reduction. A perfect start to our meal and did exactly what it was supposed to do - beg us leaving for more and set the tone for the meal to come. I had the Poached Pear and Arugula salad with a Red Wine Vinaigrette. The Arugula was not of the freshest kind, you know where you have a distinct bite to the leaves, when they have been sitting in the fridge for too long. Sadly enough, that was not the worst part of the dish. Poached Pears are sweet in themselves so the Red Wine Vinaigrette only made it sweeter. I wished there was some more Feta Cheese to offset the cloying sweetness. 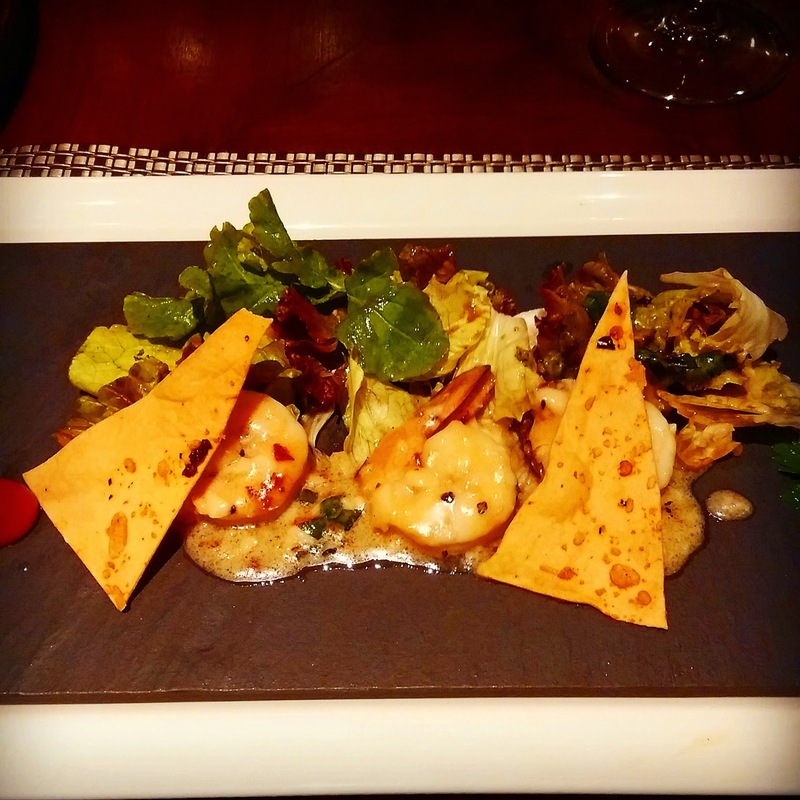 The Sambuca Prawn Salad did not taste like Sambuca at all. The portion was quite small. While it wasn't bad, I would not go back and order this. The next course was the Pizza course. 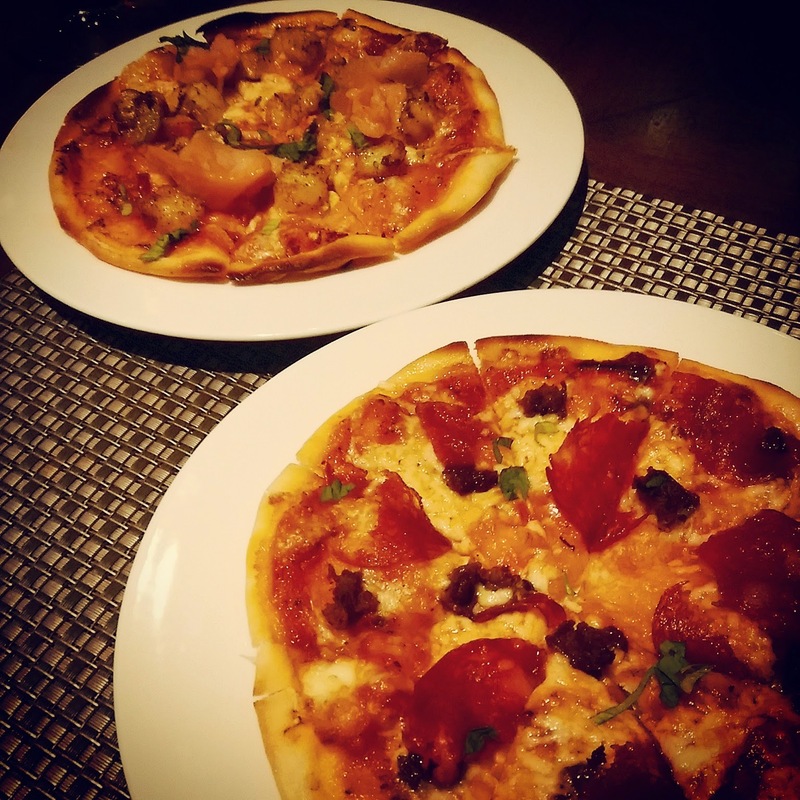 Personal Pizzas were served to us, I went for the one with Prawn and Salmon, while my plus one went for the Pepperoni and Lamb Pizza. The crust was crisp and thin. Here's the thing with places like these which offer Pizza on their menu - I feel they should really celebrate the Pizza. If a restaurant boasts of authentic flavours, and were priced at a steeper range, it is only natural for anyone to expect a Pizza that goes the extra mile, and by extra mile I do not mean exotic ingredients. I mean simple ingredients done impeccably. Exotic ingredients are just an added advantage. While we did not LOVE the Pizzas, we did not hate them either. The next course was the Main Course. I chose the Ricotta Gnocchi with Peri Peri Sauce. 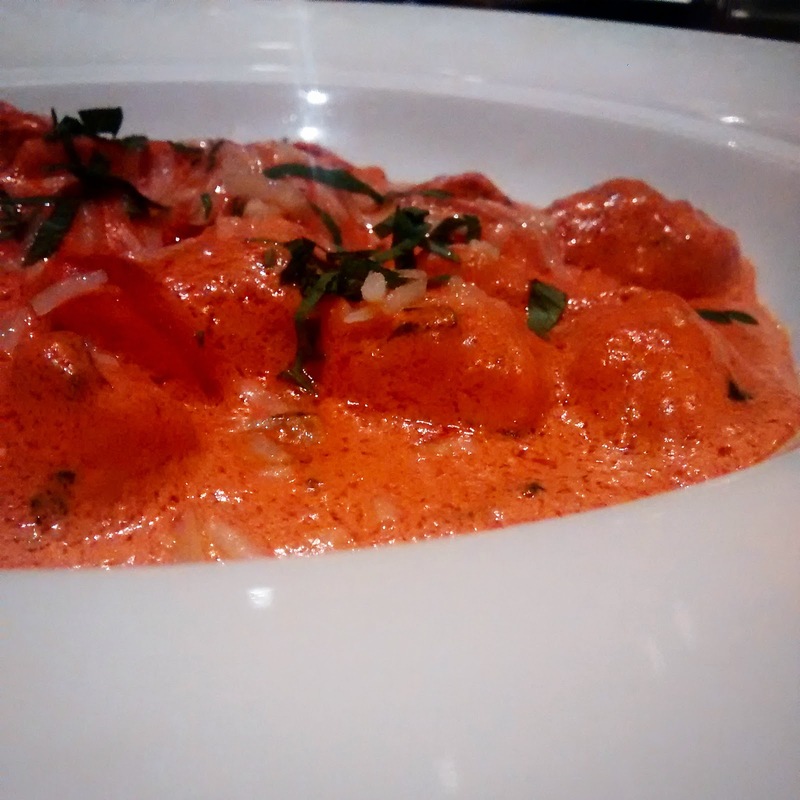 The Gnocchi was pillowy and melt-in-the-mouth, and while I say that it was one of the best Gnocchi I have had in Mumbai, the downside is that the dish was completely ruined by the Peri Peri sauce. Peri Peri in my knowledge is an African based sauce which on paper seemed perfect to go with the cheesy Gnocchi. The overtly creamy gravy tasted like... nothing. It had no taste at all. At this point I was welling up inside, because I really wanted this to go well. I wanted to flaunt a good eating place in my area. My plus one chose the Braised Lamb Navarin with Forked Mashed Potato and thankfully this was a saving grace. The meat was tender and the sauce was perfectly seasoned. When I read forked mashed Potatoes on the menu I just felt it was an excuse for poorly mashed Potatoes but I was so wrong. It all worked harmoniously well. The half eaten Gnocchi from my plate was finished off by scraping away the sauce and rolling it in whatever was left over from the lamb to make it bearable. Looking at our reactions, the server came over and asked for feedback. 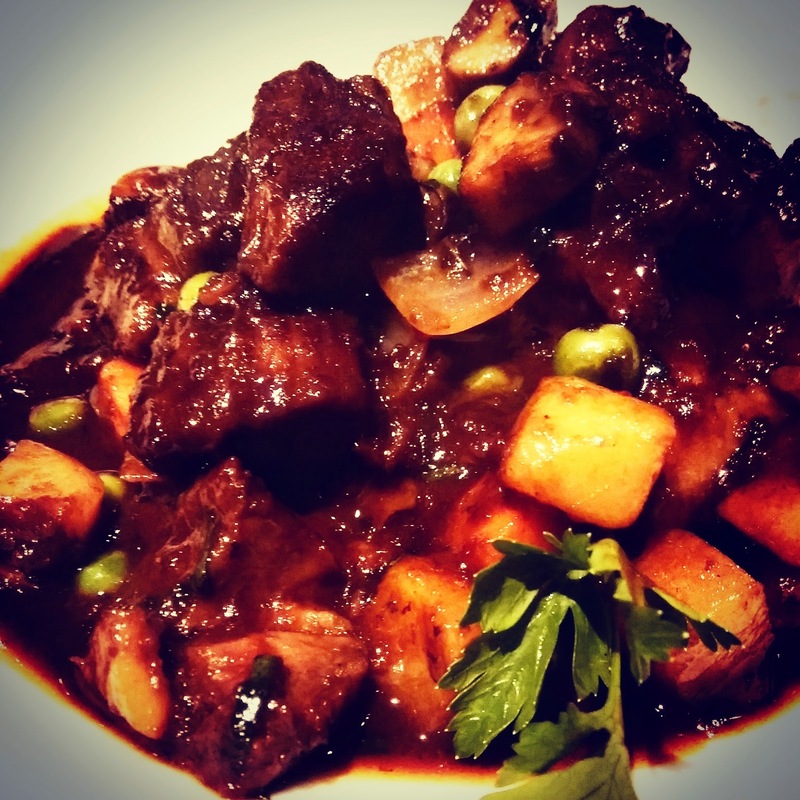 He apologized for the Gnocchi dish and offered to replace it with the Lamb. Lovely gesture, but I did not go for it. I had to save some space for dessert. Here is the other problem I had with Levo. You do not host a restaurant week if you don't have the supplies. 2 dishes that I was most excited about were unavailable. The Rawas and the Mississipi Pie. They offered us a Creme Brûlée instead of the Mississipi Pie. The Creme Brûlée was redeeming, but I don't know why there was a berry compote along with it. The Tiramisu had a chocolate sponge and a layer of whipped cream on it. You be the judge. I could not help but notice the amount of effort a boy seated on the next table was putting into cutting through his steak. I asked the family about their meal and they told me that the steak they had ordered for was rare and what came to the table was way over well done. Not just that, the Penne Jambalaya that they had was too spicy. I was watching them reach for water and calling out for more. I noticed a man in chef whites doing the rounds and addressing the tables but I have no idea why he chose to stand aside and send his server to ask us if everything was okay. As disappointed as I am with my meal, I seriously hope that the cooking staff at Levo was having a bad day. They really need to fix their food and they need to fix it fast. I hope Times City also goes over the menus at all the restaurants participating and makes sure that they are well stocked. When diners are out with a set meal with limited options, it would be nice if they were available too. I wish I had gone to some other restaurant, but I think I'm gonna wait till the next Gourmet Week! The TimesCity Gourmet Week is on from 15th September 2014 to 21st September 2014. You can make reservations here. We had dinner here which was fantastic. The bar staff at NYC events was professional and courteous! I had grilled chicken with avacado, tomato and artichoke hearts.